Come watch the scouts and leaders perform skits and songs in our annual Big Show Pack Meeting!! We will also be holding our Arrow of Light Ceremony, where our Webelos II will received the highest rank in Cub Scouts. 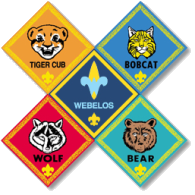 This is a major milestone for the Webelos II and they will officially graduate out of Pack 99 and move on to Boys Scouts. Location: Tyler State Park at the Upper Plantation Picnic Area*. What to Bring: lawn chairs and picnic blankets to sit on. In the event of rain, the pack meeting will still happen on Friday 4/17, but will be moved to Newtown Elementary School and start at 6:30 pm. Please watch your email Friday afternoon for a notification of any changes. *Enter Tyler via Swamp Rd. Turn Right at first stop sign. Proceed up the hill and turn left in the first parking lot.